You think you're ready for tryouts? Volleyball club tryouts and important tips for preparing to tryout for club volleyball. There are a lot of things you can do to prepare for club tryouts. The following are tips to help you prepare for playing club volleyball. 1. Research clubs in your area. Before you decide what team to tryout for, you should get an idea of what type of club you want to play for. The cost of playing club volleyball varies. Usually costs range between $600 and $3,000 a year. Most volleyball clubs have their own websites. Check out the websites and contact the club director to see if the club would be a good fit for you. 2. Pick a few clubs to focus on. After you have done some research and gotten a feel of what type of club you would like to play for, zero in on a few clubs. Definitely go to any open gyms the club is hosting. Open gyms are a great opportunity to get familiar with coaches and players. 3. Use open gyms as an opportunity to get looked at by coaches. A lot of teams will have most of the players already picked before volleyball club tryouts. It's a good idea to use an open gym as an opportunity to develop relationships with teammates. Especially if you already know you really want to play for this team. Exchange cell numbers with the players on the team and friend one another on Facebook. 4. Get really good at a specific skill. When you go to volleyball club tryouts, you need to do something that makes you stand out. Coaches need to see you do something really well. Coaches like to see players really good at a specific skill. For example, if you hit really hard, coaches will notice. Often a volleyball coach is more likely to be interested in you if you are really good at something rather than average at everything. 5. Know what positions a team is looking to fill. If you know ahead of time what positions a team is looking for, then you have a better chance of making the team if you focus on a specific position. For example, if you want to set, it wouldn't make sense to tryout for a team that has the setter position filled. 6. Visit club websites. Learn as much as you can about each club that you're going to tryout for. Most clubs have a website. Learn about the coaches and what player positions are open. 7. Get an idea of what type of club you would like to play for. How much are you willing pay for club? How much time can you devote to playing club? How high a level do you want to play? You need to ask yourself these kinds of questions before you decide what clubs to tryout for. Does the team you're trying out for have a good coach? 8. If possible, commit to a club before tryouts. A lot of clubs, especially the stronger clubs, already have their teams set before tryouts. 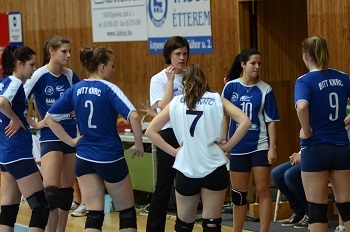 The club coaches of the best teams recruit most of their players before volleyball club tryouts. So if you want to play on one of the best teams, it's likely you need to be recruited long before tryouts. 9. Decide what clubs you are going to tryout for. A lot of volleyball club tryouts overlap and you may not be able to tryout for every club you would like. Decide on what clubs you are most interested in and go to all of their open gyms if you can. 10. During the week before tryouts, work on specific skills. If you're trying out to play middle, work on hitting middle. If you are a libero, work on your passing and defense. You want to work on the specific skills you'll be using in tryouts. Become confident in your skills development before tryout day. 1. Arrive at least 15 minutes early. Tryouts can be very stressful and you don't want to show up late and make a bad first impression. Arrive early enough to put on your gear and mentally prepare yourself for volleyball club tryouts. 2. Warm up and act like you want to be there. Coaches like to see players eager and ready to play. Grab a friend and start peppering with them. If you don't know anyone there, be friendly and ask someone to warm up with you. If there isn't anyone to warm up with, grab a ball and hit against the wall or at least doing some kind of warm up. 3. Wear something that stands out. Wear a t-shirt or some crazy socks that coaches will remember you by. You want to get noticed and have a way for coaches to remember you. It's tough for coaches to remember everyone's name, especially if they just met you. So wear something that makes it easy for coaches to remember you so they can easily describe you to the other coaches observing the tryout. 4. Shrug off mistakes. Everybody makes mistakes at tryouts, so it's going to happen. What's important is how you react to your mistakes. Coaches will watch how you react. 5. Be supportive to other players. Coaches want volleyball players that will support one another. Be friendly and show positive encouragement towards your teammates. 6. Don't look stressed. It's best if you look like you're enjoying yourself and are truly having fun. When you make a mistake just forget about it and focus on the next play. 7. Always be trying your hardest and never show frustration. If things don't go your way, don't worry about it. Just keep trying your hardest all the time.